CWC's was formed in Nov 2011 by the three directors who had recently and successfully completed a 9 month Footpath skills training course run by Cairngorm Outdoor Access Trust (COAT) in the heart of the Cairngorm National Park. Summit of Braeriach, looking south down The Lairig Ghru. The company was created to embrace the vision of building and maintaining first class footpaths throughout the mountains and wilderness areas, to protect and improve access to some of the most delicate and environmentally sensitive areas of outstanding natural beauty this country has to offer, in a caring and sensitive way. Flooded forest in the RSPB's Abernethy reserve after a dam has been constructed. When the snow falls and winter sets in in the high mountains we maintain our workload by undertaking other conservation work including bog reclamation, tree thinning, creating standing deadwood and dyking projects. Glentrool bridge and walkway over the Duack Burn in Nethy Bridge. 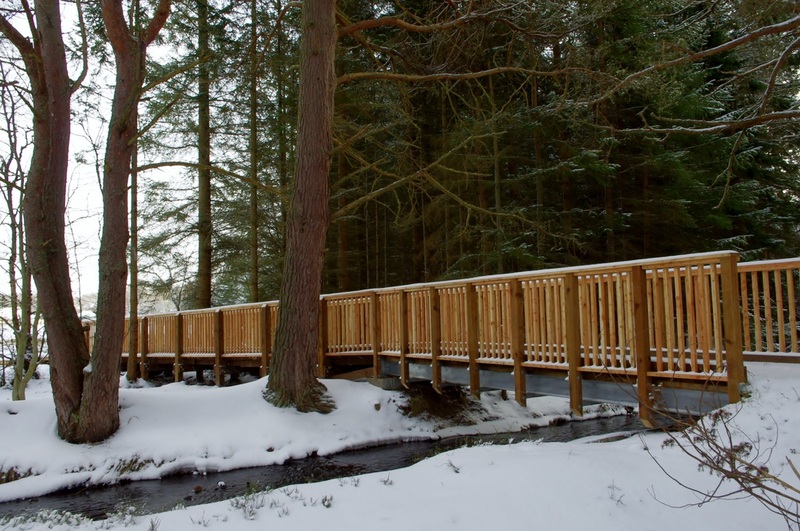 We are also able to take on the construction of footbridges, broad-walks, walkways and aggregate paths as part of local community projects that aim to help communities reconnect and link together again as well as providing walking to health benefits.